For some reason, Dell seems to favor a step by step approach in refreshing their Alienware notebooks, rather than all in one go. It was only a week ago when the company updated their M14x, M17x and M18x with NVIDIA 600 Series GPUs and mSATA support, and now the trio is being fitted for the latest Intel processers. 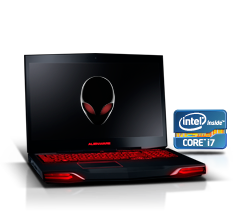 Starting from today, the Alienware M14x and M17x can be configured to include a 2.3GHz Core i7-3610QM, a 2.6GHz Core i7-3720QM or a 2.7GHz Core i7-3820QM. On the other hand, the larger M18x is privy to the previously mentioned Ivy Bridge CPUs as well as the 2.9GHz Core i7-3920XM. The M14x also retains the option for a Sandy Bridge Core i5-2450M. Furthermore, Dell has cleared up the exact GPU specs for the refreshed Alienware notebooks, starting with the NVIDIA GT650M, which will be available in 1GB or 2GB flavors within the M14x. As for the M17X, it can now be equipped with an NVIDIA GT660M/GT675M or an AMD HD7970. Unfortunately, the M18x doesn't offer any new options, but the GT675M and HD7970 can be configured in SLI or CrossFireX, respectively. The notebooks are currently available online, with the M14x starting at $1,099, the M17x starting at $1,499 and the M18x beginning at a solid $1,999.